We like being connected. When we travel, we expect stable WiFi in our hotels. When we work remotely, we seek consistent WiFi in cafes. And, most importantly, we want reliable, fast, and consistent WiFi in our homes. If you have a large home, you might have dead zones in your house where the WiFi either doesn’t reach or doesn’t reach well. If that’s the case for you, you need a WiFi booster. If you’re a fan of Google products, consider getting the Google Wifi extender. Read our full Google WiFi review to learn about this option. If you like Google products, you’ll love Google Wifi. It’s one of our favorite WiFi boosters on the market thanks to its looks, ease of use, performance, and price. If you have a large home, Google WiFi may be the best WiFi extender for you. Our Google WiFi review will go over everything you need to know about this option. We recommend the three pack. It’s easy to set up and can cover up to 4,500 square feet. Not enough? You can purchase more units and quickly connect them. Some WiFi extenders require you to create multiple WiFi networks with different names and switch networks as you move through different areas of your home. A mesh system doesn’t. A WiFi mesh system lets you create one network, with one name, for your WiFi extender(s) that will remain constant as you move throughout your home. If this sounds ideal for you, Google WiFi will be a good option. 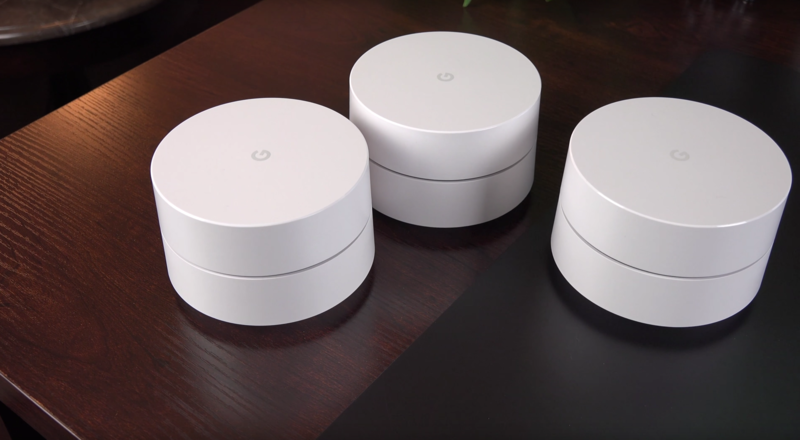 Aesthetically pleasing: Google WiFi has three small, round, white units resembling hockey pucks. They are unobtrusive and can blend well on a bookshelf or wherever you chose to put them. Automatic updates: The system automatically updates itself when new releases launch. You’re always guaranteed to have the latest and greatest. Affordable price: Google WiFi is significantly cheaper than competing mesh WiFi units on the market. Easy setup: Setup is fast and straightforward – particularly if you’re already a Google user. Ethernet ports: Each unit contains two Ethernet ports, which enable you to connect your Smart TV, gaming console, streaming player, and other devices directly to the internet system to allow for even better streaming. 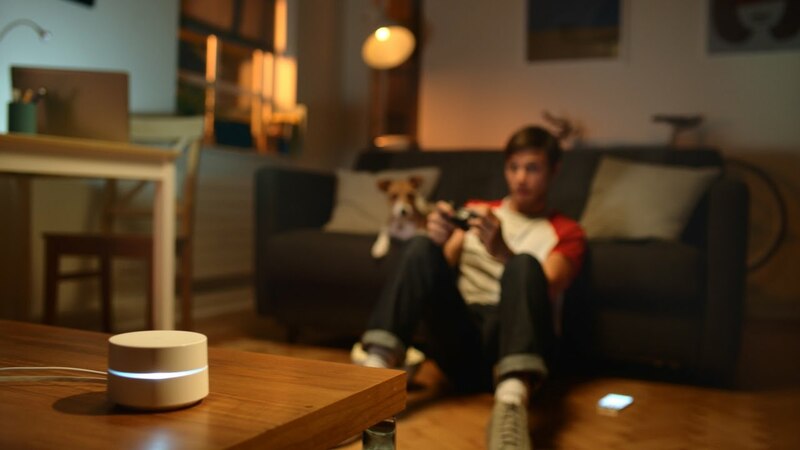 Few advanced features: Google WiFi is a basic mesh WiFi system. If you are looking for a system with a lot of bells and whistles, this isn’t it. Google account and smartphone required: Google WiFi must be set up with a smartphone and a Google account. If you don’t have a smartphone and don’t want to get one, choose another WiFi extender. If you don’t have a Google account, you’ll need to get one to set up the system. Google connection required: This WiFi mesh system requires a constant connection to Google. This connection is what keeps the devices updated with the latest software developments and keeps the units safe from hackers. However, most WiFi extenders do not require a constant connection to the vendor to function. If this is a deal breaker, consider another WiFi extender. No integrated modem: While the other mesh systems we reviewed (NETGEAR Orbi and eero) have integrated modems, Google Wifi does not. 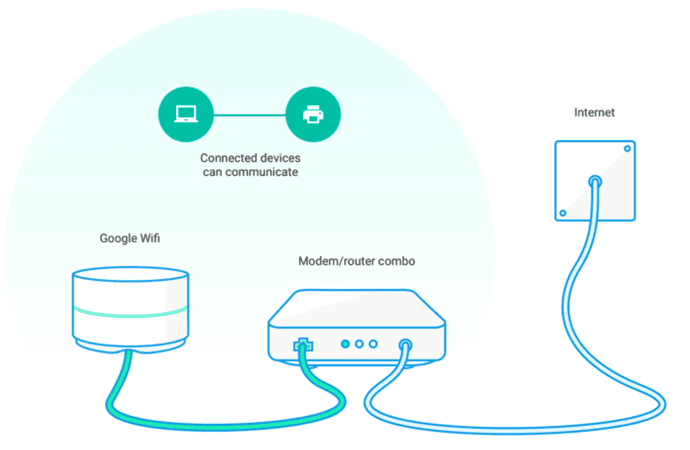 You will need a separate modem connected to one of the Ethernet ports on the primary Google WiFi beacon for the system to work. Settings and outages: If you should lose connection to the internet for any reason, you won’t have access to your settings. LAN ports on additional Wifi points. Google WiFi has many great features. We’ll go over some of them in more detail in this part of our Google WiFi review. One significant benefit of Google WiFi is that the system upgrades automatically when new updates such as better security features come out. Google WiFi replaces your existing router and works with your modem to spread WiFi throughout your home. It is compatible with major internet providers including Verizon Fios, Comcast, and Time Warner. 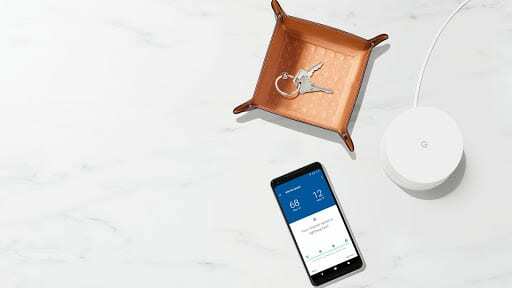 All Google Wifi units get power through USB-C, and any of the pieces can function as the core router for your system. The others will then emit WiFi signals throughout your home. Each unit covers approximately 1,200 square feet. When you move out of one unit’s range, it will seamlessly transfer you to the next unit’s range. Home or apartment between 500 and 1,500 square feet: One unit will suffice. Home or apartment between 1,500 and 3,000 square feet: We recommend using two units to have the optimal internet connection. Home or apartment between 3,000 and 4,500 square feet: Three units will give you enough coverage in a house of this size. Home or apartment larger than 4,500 square feet: Try four units. If that’s not enough, add as many as are necessary to give you the internet connection you’re looking for. To help you get the most from our Google WiFi review, we’ll go over instructions for set up in this section. Figure out where to set up your Google WiFi beacon. It will need to be connected to a modem via Ethernet cord. Ideally, the beacon should be in a central location and at eye level. Connect the Ethernet cable to the WAN port on your Google WiFi unit. Connect the other end to your modem. Next, plug the unit into a power outlet. The light will flash blue, indicating it is working and ready for the next step. Download the Google WiFi app on your iPhone or Android. Note that the app is only compatible with iOS 9+ and Android 4+. Open the app, tap “Get Started,” and sign into your Google account. Follow the instructions for setup. The app will automatically find your WiFi point and prompt you to scan the QR code located on the base. Once you do this, your phone will automatically be connected to your Google WiFi point. Set up the WiFi. Create a name for your WiFi network, then tap “Next”. You’ll create a password, then tap “Create”. Set up any additional WiFi points. Review your network. Make adjustments if necessary. Install additional software. 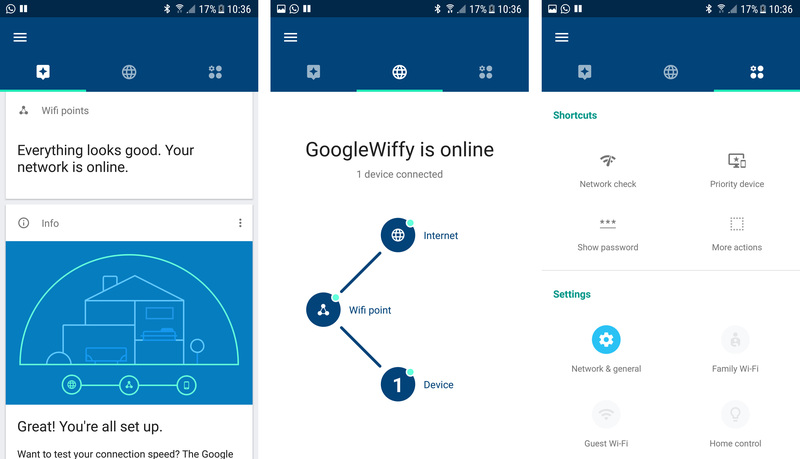 Once your WiFi points are set up, the app will download and install the Google WiFi software. The software includes the latest features and security updates. This step can take up to ten minutes. After the update finishes, the WiFi points will automatically restart. When all WiFi points light up and are solid teal, you will be ready to use your Google WiFi. Once everything is installed and functioning, you can use the same app for additional features. Want to prioritize bandwidth for a specific device like gaming or streaming 4K video? The app will help you do that. 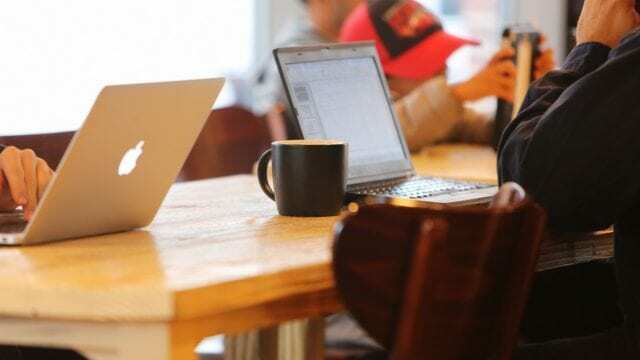 You can also monitor your networks and the devices connected to it, and conduct internet speed tests to ensure your WiFi strength is consistent. 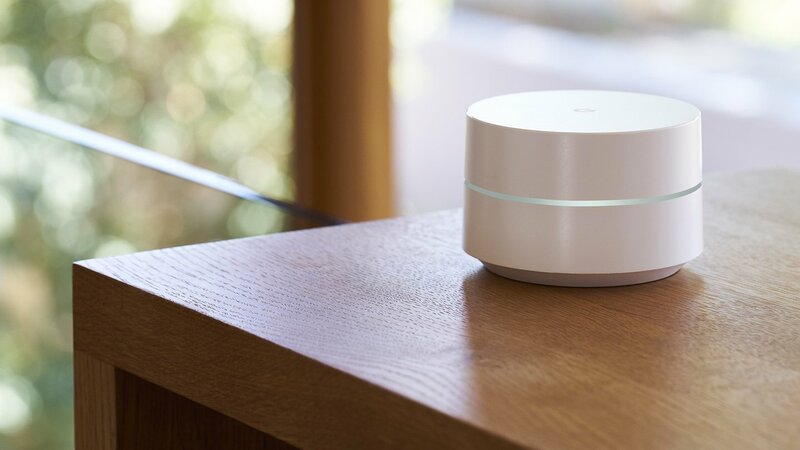 Similar to most WiFi boosters on the market, Google WiFI has a one-year limited warranty. Google warrants that a new Google WiFi device will be free from any defects in workmanship or materials under normal use for one year from the date of purchase. After our Google WiFi review, we think this is a great system. We love Google products, and this is no exception. It is incredibly easy to set up, affordable considering that you get a router and two additional extending units, and aesthetically pleasing. Google WiFi blends into the background. If you are looking for a WiFi mesh system as opposed to a simple WiFi extender, this is the best value because it is significantly cheaper than competing mesh systems. We highly recommend Google WiFi. Do you have this WiFi system? If so, leave your own Google WiFi review.